Čtyřkolka s benzínovým čtyřtaktním motorem 125 cm3. Výkon 7,5 HP, maximální rychlost 45 km/h. Nosnost 120 kg. 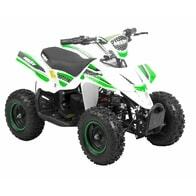 Electric ATV with 800 W engine. Power supplied by 36 V battery with 12 Ah capacity. Speed max. 20 - 25 km/h. Equipped with big 6" wheels. Weight 42 kg. Battery indicator, three speed switch, drive-chain. Max. driving range 13 - 18 km. Charging time 8 hours. Electric ATV with 800 W engine. Power supplied by 36 V battery with 12 Ah capacity. Speed max. 20 - 25 km/h. Equipped with big 6" wheels. Weight 43 kg. Battery indicator, three speed switch, drive-chain. Max. driving range 13 - 18 km. Charging time 8 hours. 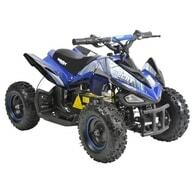 Electric ATV with 800 W engine. Power supplied by 36 V battery with 12 Ah capacity. Speed max. 20 - 25 km/h. Equipped with big 6" wheels. Weight 43 kg. Battery indicator, three speed switch, drive-chain. Mirrors, turning lights, remote-control, shaft drive. Max. range 13 - 18 km. Charging time 8 hours. 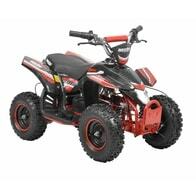 Accu ATV, 6 "wheels with tires, disc brakes, battery 36V / 12Ah, 1060W motor. Speed max 35 km / h, flag HECHT. Čtyřkolka s benzínovým čtyřtaktním motorem 125 cm3. Výkon 7,5 HP, maximální rychlost 45 km/h. Nosnost 80 kg. Accu ATV with metal frame. Wheels with tire, speed 18 - 30 km / h. Battery 48V / 20Ah. 750W engine.